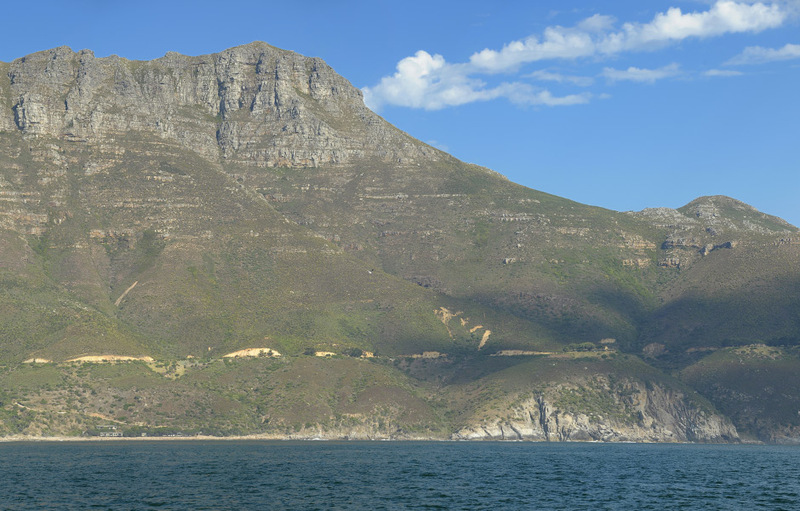 You’ll find one of the world’s most magnificent, secluded and private, luxury seaside retreats, nestled at the base of Chapman’s Peak, overlooking the scenic village of Hout Bay. Until you’ve witnesses the sun rising and setting at this exquisite haven, you haven’t really lived. 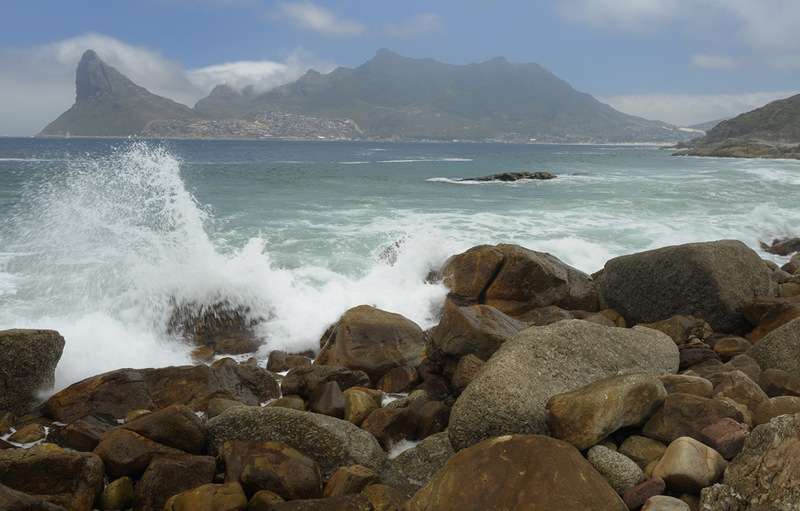 Tintswalo Atlantic Hotel is located within the Cape Mountain Reserve, known for its rich, diverse and unique flora and fauna. The hotel’s common areas are built predominantly from wood and glass to ensure that they blend discreetly into the phenomenal surroundings and so that guests can enjoy uninterrupted vistas of the majestic scenery. Make yourself at home in the lounge and catch up on your reading, or enjoy a cocktail or nightcap in the bar. The long wooden deck sports a heated Jacuzzi pool and comfortable loungers. Complementing its natural surroundings, the hotel’s decor draws from the colours of the ocean, with blues, greens, aquamarines, browns and silver reflecting the Atlantic’s ever-changing mood. Everything in the hotel takes you on a luxurious tactile journey to relaxation and inner peace. 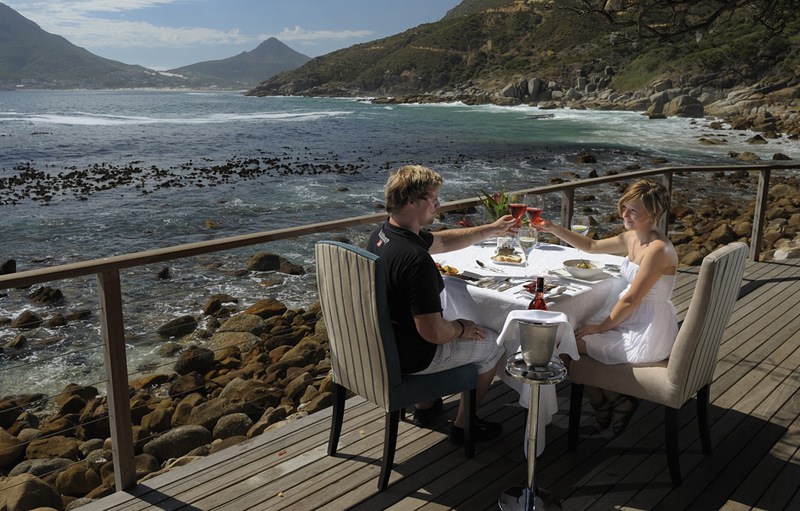 The Chefs at Tintswalo Atlantic are passionate about food, about exploring possibilities and combing flavours to achieve the ultimate in gastronomic satiety. The kitchen is open to the dining room so guests can watch the Chef’s at work and can appreciate the flavours and aromas as the culinary masterpieces are created. At mealtimes, everything is about you – what you’re craving, what will satiate your appetite at that particular time. Nothing is set in stone and at any time guests may discuss their choices with the chef, who is happy to prepare separate meals especially for you. Full English breakfasts are served daily either in the Dining Room or on the Deck. Guests may also request a private breakfast in their suite. If you’re starting your explorations early, the hotel will happily pack a breakfast for you. When you’re feeling peckish in the middle of the day, you can choose from the daily set menu or talk to the chef who will gladly prepare individual dishes which are served in the Dining Room, at the Kitchen Counter, on the Deck or in the privacy of your room. Afternoon tea is a decadent treat with sumptuous selections to be enjoyed on the restaurant deck, in one of the lounges or via room service if desired. At dinner the hotel caters for any guest request, whether it’s a four-course set menu or a single course dinner. 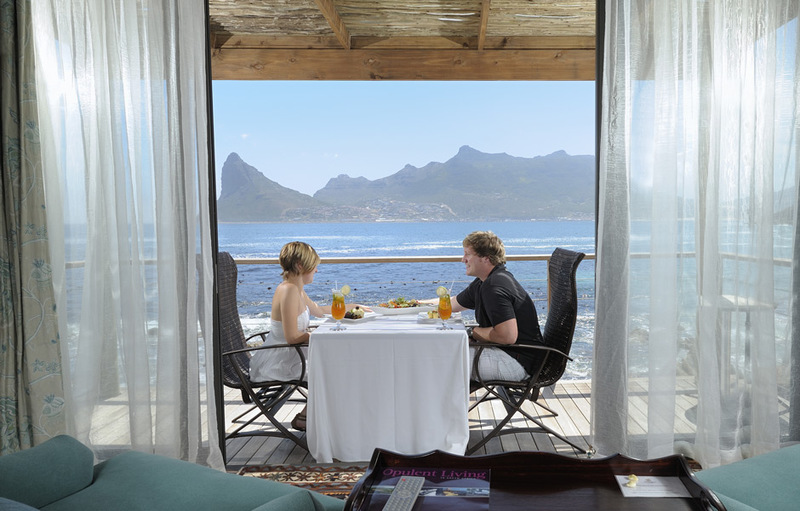 The 10 Tintswalo Atlantic suites have been authentically decorated to evoke the experiences and colours of a number of well-known islands around the world. All are air-conditioned and sit quite literally on the edge of the Ocean with astounding views of the majestic Sentinel across the bay. Whale watching from the extreme comfort your suite is an effortless activity at certain times of the year. 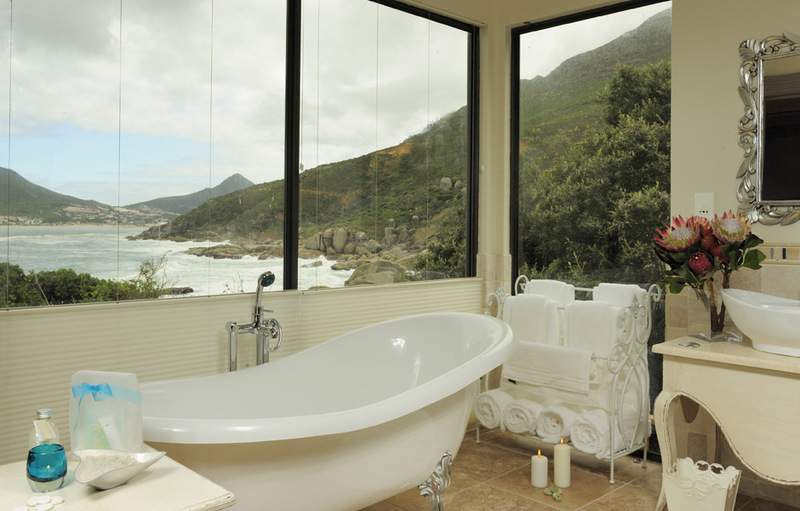 The en-suite bathrooms with his and hers vanities and showers also enjoy an uninterrupted marine view. 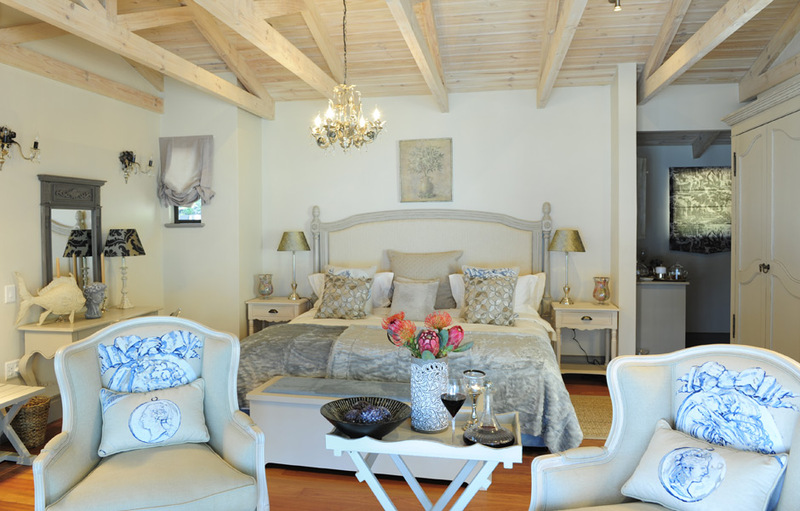 The Robben Island Suite pays homage to ex-President Nelson Mandela who called the island home for nearly 24 years. It is a quirky yet real reminder of South Africa’s transition. The room is decorated in glorious greens and yellow gold. The soft comfy armchairs are in the perfect position for watching the waves. Bringing the stunning Greek Isles to mind with its crisp white linens offsetting the blues and indigos this room is a luxurious seaside treat. Lamu is a Swahilian island just off the coast of Africa. Previously a penal colony it holds special memories for the owners who once visited it. Lavishly decorated in burnished bronzes and opulent oranges, this suite is a wonderful reflection of the vibrant colours of the sunsets and the determined and welcoming spirit of the peoples along the east coast of Africa. This classic and elegant suite pays formal tribute to exquisite and demure Italian style. Delicate and neutral taupes are offset by the pale greens and blues of the Atlantic Ocean. Off the coast of Madagascar lies the Sainte Marie Island. Decorated in beautiful soft yet vibrant pinks and peaches, this suite is striking for its extended use of glass and light. It is the collection’s most feminine suite. Cousine Island in the Seychelles is a sanctuary to the most beautiful species of shells, fish and marine life in the region. In the Cousine Island Suite the light from the crystal drop-tear chandelier dances off aquamarine walls accented by turquoise, taupe and emerald throw pillows, all reminiscent of the Indian Ocean and its coral reefs. With a distinct Balinese influence for the islands after which it was named, this suite is the most masculine suite in the collection. It’s bold and varying shades of blues, indigoes and violets exude a naturally warm and inviting atmosphere. This Caribbean ‘shabby-chic’ styled suite will appeal to those with a sense of fun and whimsy. Bright lemon walls and bold and colourful geometric patterns bring the island a little closer to you. In the Sea of Marmara not far from Istanbul are nine islands known as the Princes’ Islands. Byzantine influence is evident in the in the use of terracotta and clay colours which evoke a warm, yet fresh ambience. The room is filled with luscious textures and bathed in warm light from the jewelled drop-tear chandelier. Inspired by the one of East Africa’s most popular islands destinations this suite has a distinctly Moroccan feel. The hand-crafted detailed wooden headboard is striking against the aquamarine walls.